Americans' slate of national priorities has remained in place for months — the war in Iraq, the economy and jobs among others — with one new addition to the palette: gas prices. But when asked about congressional accomplishments so far this year, fewer than half can name anything Congress has done. For those in the minority who can, the legislation spurred by the Terri Schiavo case (which isn't mentioned by the public as a priority) stands out as the most memorable. More Americans disapprove than approve of the job the president and Congress are doing, and a majority thinks the country is on the wrong track. Despite the efforts of President Bush and Republicans in Congress, public support for Social Security privatization remains unchanged this year. Views on the war in Iraq, which Americans see as a top problem now facing the country, remain mixed. Many say rising gas prices affect them a lot, and most think a president has the power to do something about them. Public approval of Congress remains nearly as low as it was last month during the Congressional intervention in the Terri Schiavo case, an intervention most Americans disapproved of. Now, 35 percent approve of the job Congress is doing, while 51 percent disapprove. Approval ratings for Congress have historically been low, rarely moving above the 50 percent mark since this poll began the question in 1977. Still, recent congressional ratings are at some of their lowest points since 1997. Disapproval of Congress is strongest among Democrats (59 percent), but 39 percent of Republicans also disapprove. This Republican Congress receives mixed reviews for its accomplishments this year. Thirty-seven percent think what they've done so far has been good for the country, while slightly more — 41 percent — think what they've done has been bad for the country. These views are highly partisan. REPUBLICAN CONGRESS' ACTIONS SO FAR: GOOD OR BAD FOR COUNTRY? Views were more positive in 1995, just after the Republican takeover of the House. Then, 48 percent thought what the Republican Congress had accomplished was good for the country, and 33 percent thought it was bad. Some of the current negativity about Congress may be attributable to the legislature's involvement in the Terri Schiavo matter. When asked which one thing that Congress has done over the past year sticks out in their mind, the top response is Congress' involvement in the Terri Schiavo case, volunteered by 9 percent. 3 percent name the war in Iraq — an issue at the top of Americans' priority list. For many Americans, NOTHING Congress has done this year sticks in their memory — 4 percent said Congress had accomplished nothing, while 68 percent said they could not name anything it had done. The impression on public opinion of Congress' association with the Schiavo case seems to have been more negative than positive. Half of those who name the Schiavo matter as the most notable Congressional accomplishment think that what the Republicans have done so far has been bad for the country, nearly two-thirds of them disapprove of the job Congress has done, and six in ten have an unfavorable view of the Republicans in Congress. Among one important Republican constituency — Republican evangelical Christians — there wasn't any more mention of the Terri Schiavo case as Congress' most notable action than there was among all Americans. Nine percent of them volunteered that as the most memorable congressional action, while 4 percent named any actions concerning the war in Iraq. The Terri Schiavo case and its related issues don't merit mentions on Americans' priority list today. When asked to name the most important problem the country is facing, the war in Iraq ranks on top, mentioned by 16 percent, followed by the economy and jobs at 15 percent, Social Security and terrorism (each with 6 percent), and health care and gas prices (each with 5 percent). But few Americans think Congress pays a lot of attention to the wishes of voters anyway. Only 8 percent think members of Congress pay a good deal of attention to the people who elect them when they decide what to do in Congress. Forty-three percent think they pay some attention to voters, and 43 percent think they pay not much attention. These percentages are similar to views found in this poll in 1993, the year before the 1994 Republican takeover. HOW MUCH ATTENTION DOES CONGRESS PAY TO PEOPLE WHO ELECT THEM? President Bush's overall approval rating has changed little since last month: 44 percent of Americans approve of Bush's job as president, and 51 percent disapprove. Mr. Bush's approval rating has been under 50 percent since January of this year, and this is only the third time his disapproval rating has reached 50 percent or higher since he took office. On the issues of the economy and the war in Iraq, Mr. Bush's ratings are similar to what they were in March. 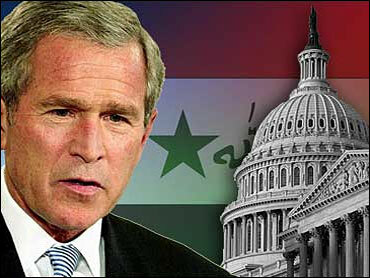 34 percent now approve of Mr. Bush's handling of the economy, and 39 percent approve of his handling of Iraq. Since the attacks of September 11th, Mr. Bush's handling of terrorism has been his strongest issue. In this poll, just over half of Americans approve of the president's handling of the campaign against terrorism, down from 61 percent in February. In addition, seven in 10 Americans express uneasiness about President Bush's approach to Social Security, which he has attempted to make the hallmark of his second term. More Americans are uneasy about Mr. Bush's approach to Social Security today than they were in February. Now, just a quarter feels confident that Mr. Bush will make the right decisions regarding the program. Americans' uneasiness about the president's handling of Social Security may stem from their less-than-enthusiastic support for his plan to partially privatize the system. Forty-five percent now say allowing individuals to invest a portion of their Social Security taxes themselves is a good idea, but slightly more — 49 percent — say it is a bad idea. Views on the president's plan have not changed since January, despite active campaigning for it by the president and other Republicans. Men, Republicans and those in higher income brackets favor partially privatizing Social Security, while women, Democrats and lower income Americans oppose the idea. Also, those under age 45 are more likely than older Americans to say private accounts are a good idea. While Americans may not be ready to embrace Bush's plan, half do not think Social Security will have enough money available to provide them with the benefits they expect for their retirement. This belief it not new, however; it has been the same for many years. WILL SOCIAL SECURITY PROVIDE YOU WITH RETIREMENT BENEFITS? Two years after the fall of Baghdad, and with the war in Iraq ranking as the most important problem now facing the country, Americans divide on whether the U.S. did the right thing sending troops there. Forty-seven percent say the U.S. did the right thing in going to war, while 48 percent say the U.S. should have stayed out. For the past year, opinion has been divided much as it is now. RIGHT THING TO TAKE MILITARY ACTION IN IRAQ? Americans are also split on how things are going for the U.S. in Iraq: 48 percent say things are going well, while 50 percent say things are going badly. In February, on the heels of the Iraqi elections, more Americans (53 percent) said things were going well for the U.S.
HOW ARE THINGS IN IRAQ GOING FOR U.S.? The average price of gasoline in the United States is now more than $2 per gallon, and a majority of Americans report being personally affected by the high prices. Most Americans say this is an issue the president can do a lot about. HOW MUCH DO HIGHER PRICES FOR GAS AFFECT YOU? Those most affected by current high gas prices are Americans living in the South and rural areas, those earning less than $30,000 a year, and people between the ages of 18 and 29. Americans may be looking to the White House for some relief: 61 percent of Americans think the price of gasoline is something a president can do a lot about, while 31 percent say it is beyond any president's control. IS THE PRICE OF GASOLINE SOMETHING A PRESIDENT CAN DO A LOT ABOUT? Partisanship colors this view, though: Three-quarters of Democrats think high gas prices are something a president can do something about, compared to 44 percent of Republicans. Most — 63 percent — say they will continue with their vacation plans this summer despite higher gas prices, but 34 percent will change their plans. Among those who have been affected "a lot" by higher prices, 48 percent say they will alter their vacation plans. DO YOU EXPECT TO CHANGE YOUR VACATION PLANS DUE TO HIGH GAS PRICES? Americans are now more pessimistic than they have been in recent months about the direction of the country. Sixty-two percnet say things in the U.S. have seriously gotten off on the wrong track; one third says things are headed in the right direction. Rarely in this poll has the percentage who think the country is on the wrong track been this high; the most recent instance was in May 2004, when 65 percent said so. Sixty-five percent of Republicans see the country as headed in the right direction, while 83 percent of Democrats and 67 percent of Independents see it on the wrong track. Aside from Republicans, pessimism about the direction of the country is spread across a wide array of demographic groups. Majorities of all ages, income, and racial groups, and in all regions of the country see things as on the wrong track. Congressional Republicans themselves are viewed a bit more negatively than Democrats. Forty-two percent of the public has a favorable opinion of Republicans in Congress, compared to 49 percent for Democrats in Congress. As would be expected, views of each party in Congress are highly subject to partisan leanings. Americans view their own party's delegation favorably, and the opposing party's negatively. Although they are well-known names to those in Washington, D.C., most Americans just haven't heard enough about key Republican Congressional leaders to rate them. House Majority Leader Tom DeLay, who has been criticized recently for possible ethical lapses, is the best-known of the three leaders tested in this poll. Opinion of him are more negative than positive by three to one among those who know of him — but seven in 10 Americans are undecided or don't know enough about him to have an opinion. Less than two in ten have an opinion of Senate Majority Leader Bill Frist; they are divided on him. Only 13 percent have an opinion of Speaker of the House Dennis Hastert; those few are also divided. Most Americans think it is important which party controls Congress — but that's what they thought in 1998 too. Forty-three percent say which party controls Congress is very important to them, and another 41 percent say it's somewhat important. Only 15 percent think that is not important. While public approval of Congress overall is low, the public is much more approving of the job their own congressional representative is doing: 57 approve approve, and 23 percent disapprove. This dichotomy — disapproving of Congress as in institution, but approving of one's own congressperson — is not new; it has been documented by this poll and by political scientists for decades. This poll was conducted among a nationwide random sample of 1,149 adults interviewed by telephone April 13-16, 2005. The error due to sampling could be plus or minus three percentage points for results based on all adults. Error for subgroups may be higher.